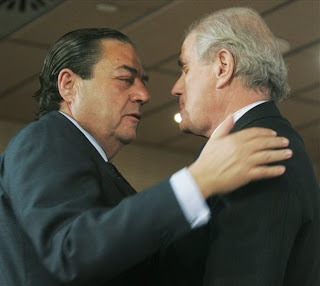 The deputy President of Real Madrid Vicente Boluda, who now takes charge of the club, listens to the President of Real Madrid Ramon Calderon during a press conference at the Santiago Bernabeu stadium in Madrid, Friday Jan. 16, 2009. Ramon Calderon quit as Real Madrid president on Friday following a vote-rigging scandal. Calderon's turbulent tenure as head of the world's biggest football club appears to have come to an end after a Spanish newspaper reported that the 57-year-old lawyer had manipulated a general assembly vote, effectively a vote of confidence, in December. Construction, Law and now Shipping. This defines the various backgrounds of the last three presidents on Real Madrid. While Florentino Perez was a construction magnate and Ramon Calderon made his name as a lawyer, Vicente Boluda has made his name in the shipping industry. In 1998 he received the 'Enterpriser of the Year' award for his work in the Boluda Group, against rivals such as La Caixa and IBM. Along with his own personal success, Boluda has a very successful family, with his grandfather, Boluda Marí, giving rise to a naval empire that has since expanded massively to cover various ports around the world. Now, they operate not just on the shore but also at sea, where they participate in off-shore rescue, and fight against contamination. his Board and for being his friend." "I take over the Presidency as an act of responsibility and an obligation I cannot refuse. An institution like Real Madrid can't be devoid of power until the next election, which will take place this summer. I ask Madridismo to stand united and to act responsibly, and I wish to ask all of you to allow us to do our jobs in a calm and confident atmosphere." "Our football and basketball squads have important goals to achieve this season and they deserve our support more than ever. I offer our fans and Club Members my full dedication to this organisation. I will defend the interests of the Club with all my heart. Thank you." Personally, I dont like what they have on offer (Perez and Villalonga). One is famous for the galactico era which went so wrong and the other seems to be a money monger. But then if I had to choose between these two, I'd go with Perez since he did have 3 fantastic seasons at the club and its logical to assume that he has learnt from his mistakes. And I am assuming your name is Joan?! I felt a tingle deep down and my ego just grew a little more after my name was mentioned, is that wrong ? Anyway back to the topic at hand, Are the Madridistas behind Boluda ? Do they have any faith in him and do the trust him ? And do they feel he should have resigned with Calderon ? Those are the questions i pose. Nope Ashay the 1st comment was mine... (Shekhu). Boludo means 'huge balls' in Argentina lol..I know this guy's name is Boluda, but its funnay anyway..He looks like a Mafia king lol..
i dont think he should be too proud to admit that unless it was christmas charity like friends with insane idiots...also any change from calderon is a good change... just hope mija follows calderon as well..